Welcome to AA Driving School. Weâ€™re here to make learning to drive a simple, enjoyable and memorable experience. As well as being guided through this process by a fully qualified driving instructor, youâ€™ll have access to the AA Theory Test App. And whatâ€™s more, your one yearâ€™s Standby AA Membership* means youâ€™ll have access to our Member Benefits Program. 1 Read and accept the AA Driving School Pupil Terms and Conditions. These Terms apply to your contract with your Driving Instructor. Please read them carefully and make sure you understand them. You should keep a copy of the Terms for your own records. You must accept these Terms and Conditions before your lessons commence. 2 Print your Progress Record and complete the Your Experience questionnaire. 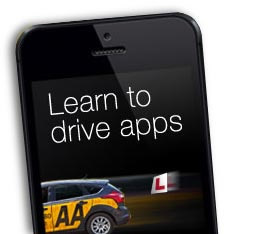 3 Download Your Lesson Guide workbook which contains useful information on learning to drive and recommended Apps to help you prepare for your theory test. 4 Take your Progress Record and your Provisional driving licence to your first lesson. Remember to wear appropriate shoes for driving and take any glasses/contact lenses you will require. Don't worry, your instructor will have copies in the car. If you receive SMS lesson reminders and you want to cancel this service or change a lesson, call us on 0800 072 0635 (Option 2). To top up your account, you can either call us or log on to our website. For more news and updates, follow us on Twitter or like us on Facebook. Unless you are already covered by AA Membership, you will be eligible for AA Standby Membership, Then should the vehicle in which you are travelling break down, your Standby Membership* means you can call us for roadside assistance, for a fixed fee of £80 per callout. Weâ€™ll take a card payment over the phone and an AA patrol will be with you shortly. If for any reason we canâ€™t fix your car by the roadside, weâ€™ll recover you and up to seven passengers to the nearest suitable garage. You can cancel or upgrade your Membership at any time by calling 0800 085 2721.
ePub file works on this platform For Apple platforms, you can download iBooks for iPad/iPhone for free here. ePub file works on this platform For Android platforms, you can download the iBooks for Android by Aldiko Free Book Reader application here. Mobi file works on this platform For Kindle, you need to log into Amazon/Kindle account and add our email address to your address list in order to accept the Mobi file from us. You need to then move the Mobi file to your Books folder in your Kindle to open the Mobi file in eBook reader of Kindle. Please connect the Kindle to your computer via USB cable and move the Mobi file to Book folder. ePub file works on this platform You can open the ePub file of the eBook via links. ePub file works on this platform The ePub file of the eBook will be downloaded to Downloads folder and then be opened by an eBook reader.Â You can download the iBooks for Android by Aldiko Free Book Reader application here. Your lessons are only valid if they are bought through AA Driving School. If your lessons have been bought through another source please contact us immediately on 0800 072 0635. * Standby Membership activated after first lesson unless you have already opted out. Bookings made online or directly with your instructor can opt out by calling 0800 085 2721. You will receive your Membership pack separately. Automobile Association Developments Limited. Registered office: Fanum House, Basing View, Basingstoke, Hampshire RG21 4EA. Registered in England and Wales. Number 1878835. For further information please visit www.theAA.com.